Synchrotron radiation is emitted by electrons orbiting in a storage ring. It delivers ultra-bright X-rays which are used for a wide range of analytical techniques. Electrons ejected by X-rays from molecules, solids, surfaces, and interfaces reveal how the atoms are bonded to their neighbors. Electrons and photons emitted from core levels (=inner shells) are particularly useful in identifying an atom and and its bonding configuration. Soft X-rays between 50 and 1500 eV provide optimum chemical resolution due to the narrow energy width of the corresponding core levels. This can be combined with optimum depth resolution at surfaces and interfaces, because the emitted photoelectrons have a very short mean free path (only a few atom distances). Overview of photoelectron spectroscopy: F.J. Himpsel and I. Lindau, Ch. 9, Photoemission and Photoelectron Spectra, Encyclopedia of Applied Spectroscopy, Edited by David L. Andrews, Wiley-VCH, (Weinheim 2009). ISBN: 978-3-527-40773-6. Undulators are periodic magnet structures that represent the state of the art in producing synchrotron radiation. They exhibit a spectral brilliance up to 10,000 times higher than conventional bending magnets. Undulators at the Advanced Light Source (ALS) cover the spectral range from 100-1000 eV photon energy, which contains the sharpest core level of each element. A special photoelectron analyzer displays an image of the photoelectrons emitted in various directions. With the high brightness at an undulator at the ALS such images take only a few seconds to acquire. That makes it possible to quickly explore electrons emitted in all directions and thereby obtain a complete picture of electrons in solids and at surfaces. Emission pattern of photoelectrons from the (111) surface of diamond, measured in two seconds at the ALS. The most common method for describing electrons in solids is local density theory. The 1998 Nobel Prize in Chemistry was awarded for the development of this method. It works so well that it has been difficult to test its limits and to find ways to take its accuracy to the next level. As a fundamental characteristic of the electrons one can choose their band width, which reflects the strength of their interactions. This number can be obtained from a series of images of photoelectrons emitted by synchrotron radiation at different energies, such as those shown below. These data from diamond achieve 1% accuracy, ten times better than previous experiments. It is found that the band width is 7% too small in local density theory, but well-described by quasiparticle calculation, the latest theory of electrons in solids. This type of measurement has been performed for protopes of an insulator (lithium fluoride), a semiconductor (diamond), and a semi-metal (graphite). Graphite: Heske et al., Phys. Rev. B 59, 4680 (1999). 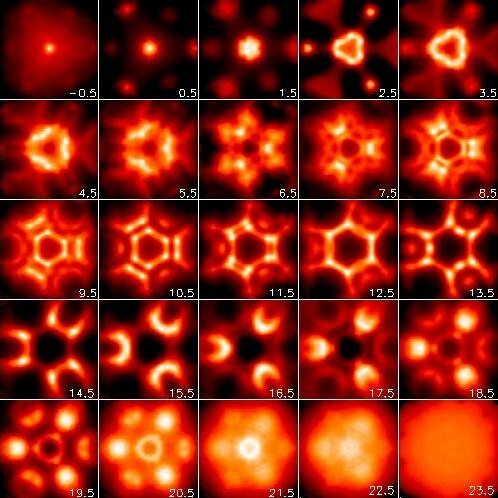 Images of photoelectrons from diamond at various energies below the top of the valence band (in eV). The most energetic electrons (those with energies close to the Fermi level) determine many interesting properties of solids and molecules. Examples are electrical conductivity, magnetoresistance, superconductivity, magnetism, and chemical reactivity. Only a narrow energy slice around the Fermi level is relevant. Its width corresponds to the levels that are thermally accessible (about 3.5 kT, with kT=25 meV at room temperature). The energy and momentum resolution of photoelectron spectrometers has improved such that electrons within a few meV around Fermi level can be probed. Angle-resolved photoemission provides the information about the momentum k of these electrons. 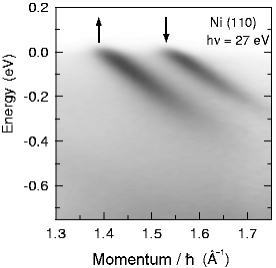 Energy bands of nickel close to the Fermi level, measured with high resolution at the Synchrotron Radiation Center (SRC) in Madison. The magnetic splitting between spin up and spin down electrons is clearly resolved near the Fermi level (Energy = 0). The slope of the dark lines corresponds to the electron velocity. From Altmann et al., Phys. Rev. Lett. 87, 137201 (2001). Synchrotron light sources provide tunable X-rays and thereby enable X-ray absorption spectroscopy (XAS). This technique measures excitations from the core level of a specific atom into its empty valence orbitals. As the resulting core hole gets re-filled, the atom emits either electrons or X-rays. Electrons dominate for shallow core levels, which are the sharpest. The characterisctic fluorescence photons emitted by deeper (but broader) core levels are needed for detecting dilute atoms, such as in catalysts or for environmental contaminants. XAS of the sharpest core levels is difficult with fluorescence detection because of the small cross section, but it has become possible with the leap in spectral brilliance created by undulators. The spectral range of the ALS is suited particularly well for semiconductors, organic materials, biomolecules, and magnetic materials (see the table of the sharpest core levels of the elements and their binding energies). XAS has been used for a wide variety of applications. A few samples from Beamline 8.0 at the ALS are given below. A bendable upstream mirror allows a wide range of focal points located at various endstations. For radiation-sensitive organic and bio-materials the light can be defocused as well. Various photon detectors allow for an optimized trade-off between spectral selectivity and detection efficiency. 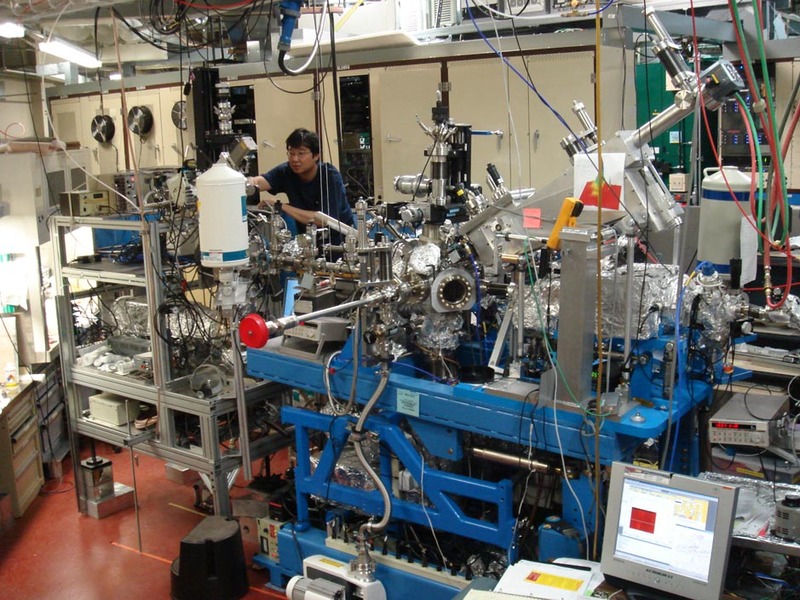 The nearby Molecular Foundry provides many capabilities for synthesizing nanostructures, as well as for identifying orbitals by state-of-the-art calculations of XAS spectra. Dyes for biomimetic solar cells: Cook et al., J. Chem. Phys. 131, 194701 (2009). Atom-specific orbitals in a donor-absorber-acceptor complex: Zegkinoglou et al., J. Phys. Chem. C 117, 13357 (2013). Two endstations in a row for photon in / photon out spectroscopy of nanostructures at the ALS. Supported by NSF-DMR, NSF-CHE, and DOE-BES.